Michael Roberts was born in Aylesbury, UK, in 1947. His mother came from St. Lucia island in the West Indies. He studied graphic and fashion design at High Wycombe College of Art, in England. His original intention was to become an art director a J. Walter Thompson, but instead he became a freelance fashion illustrator, working for publications including the Sunday Times, Nova, Vingt Ans and British Vogue. 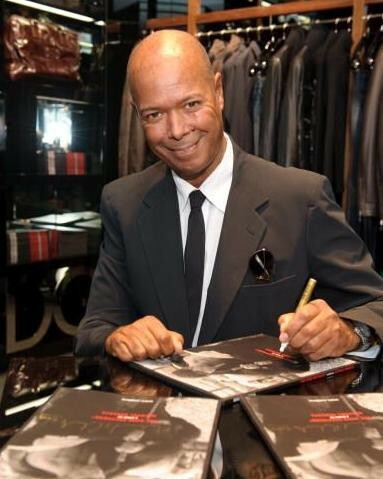 In 1972, he joined the Sunday Times as fashion editor and in 1981 became fashion editor of Tatler magazine. 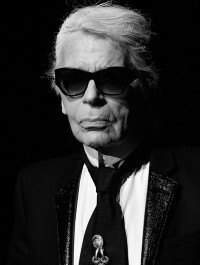 In 1983 he moved to Vanity Fair in New York, but returned to Britain the following year to Tatler as Fashion Director. In 1986, he was also appointed Design Director of British Vogue. Roberts is now a contributing photographer to Manner Vogue, L'Uomo Vogue, British Vogue, French Vogue, Vogue Hommes, Vogue Espana, GQ in America and England, Vanity Fair, Sunday Times, Independent, Interview, Harpers and Queen and Esquire. In Britain, the once-staid pages of Tatler magazine have been tremendously enlivened by multi-talented Michael Roberts. His April Fool issue of Tatler transformed punk designer Vivienne Westwood into Margaret Thatcher. His repertoire extends far beyond the simple knack of making clothes look good in pictures. He is a phenomenon: writer, photographer, video director, editor and artist. His outrageous sense of style and venomous pen have made him the fashion world's perennial 'enfant terrible'. He orchestrates fashion shows and photographs them with a taste for witty send-ups and high camp that has made him notorious. His eye-catching illustrations, often with a primitive African theme, (such as that for Azzedine Alaia in 1991) are characterized by flat patterns or decoupages and are painted in violent colours. He is particularly interested in the juxtaposition of illustrations and photographs. "I think of my illustrations solely as a graphic device for depicting a particular fashion - they are more images than illustrations. 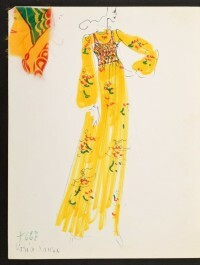 There is a consistency of style in my drawings, despite their apparent disparities, but it is the designer's ideas behind the clothes themselves that dictates what I make of them, I do not impose my own style of drawing over their ideas."